Watch GuildWars2Live.com's Own3D channel between June 8 and 10, for a chance to win one of 3 copies of Edge of Destiny. 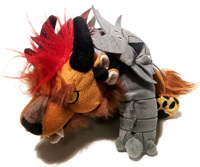 We're also throwing in a Charr Plushie! 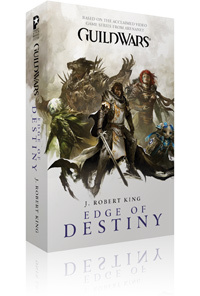 Each copy of Edge of Destiny is valued at $7.99 USD and the Charr Plushie is valued at $34.99 USD. Streamers will be announcing sweepstake codes on their show, once every hour during the Beta Weekend Event, for registered users to enter on this page. Sweepstake codes do expire, so enter them immediately when they are announced. Each unique code you enter will increase your chances of winning a copy of the book! Every 3 unique codes you enter will increase your chances of winning the Charr Plushie! That means there is a chance that one lucky viewer could win a book and plush at the same time! The winners will be announced on Tuesday June 19, 2012. Just like the first beta weekend event, we're doing a full 60 hour live stream right here on GuildWars2Live! Check the schedule page for the complete programming. Please follow us on Twitter too @GuildWars2Live for more updates! If we reach 3000 followers before the next Beta Weekend, we'll make the next sweepstakes after this one even better! The Elder Dragons have risen from their millennial slumber, spreading corruption and devastation everywhere. Now the mortal races of Tyria stand on the edge of destiny. Heroes have battled against the minions of the dragons, only to be corrupted by the enemy. Great armies have marched against the dragons, only to be swept away like leaves in a gale. The dwarves sacrificed everything to defeat a single dragon champion. The age of mortals may soon be over. This is a time for heroes. While the great races stand divided, six heroic individuals will unite to defend Tyria: Eir, the norn huntress with the soul of an artist; Snaff, the asura genius, and his ambitious assistant Zojja; Rytlock, the ferocious charr warrior in exile; Caithe, a deadly sylvari with deep secrets; and Logan, a valiant human with divided loyalties. Together they answer the call. Together they become Destiny's Edge. But will it be enough? Everyone needs a little charr in their life! This adorable plush version of Guild Wars 2's ferocious feline charr will stand guard as you work, sleep, or play! Made from huggable high-quality material, this 17 inch long plush is as fierce and rugged as a charr centurion. Each unique code may only be entered once per registered user and within a time limit after its announcement. Open to residents of Canada (excluding Quebec), United States and Europe. Winners will be announced on June 19th on GuildWars2Live.com and prizes will be shipped the following day. Winners will be contacted through the forums by private message (and by E-mail as needed). For each unique valid code, entrant is given one chance to answer the skill testing question correctly. Sorry, this sweepstake has ended.